This post could also be called, One Title Does Not Fit All. I had the hardest time trying to decide what to call this one. You see, this post is sort of a “What Works For You” and a “Reader Request” all rolled into one. With some organizing ideas thrown in for some fun. A few years ago, Nicky and her husband were in the market to buy a home, and they opted to buy one that would allow them to place their own stamp on it. The house they chose was a perfect fit; it checked off all their ‘must haves’ and many of their ‘would like to haves’. It came with an unfinished basement that was already wired and had even been plumbed for a bathroom. A kitchen with no upper cabinets. Seriously, NO upper cabinets, not even shelving – the walls are bare from the counter up. The only full bath had an open vanity with no real storage and the half bath on the main floor has a pedestal sink. Like many fixer uppers this one came with its highs and its quirks, and one low point as far as Nicky is concerned. In their 3 level, 4 bedroom home, there are a total of 5 closets. The ‘linen closet’ is in the unfinished basement and measures 12 inches wide by 12 inches deep and about 6 feet high. It’s at the far end of the basement by the furnace and hot water tank. It’s not near anything, (their laundry room is on the main floor). The other four closets are in the bedrooms, or rather in three of the bedrooms. Each of her boys has a basic reach in closet in their rooms, and in the master bedroom there are his and hers closets. His is a basic reach in, and kind of small for a master bedroom. Her’s was dubbed a walk in, but she calls it a step in, cause it’s only big enough to take a step into. And that’s it! No coat closet by any of the exterior doors, no closet under the stairs, not even a pantry! 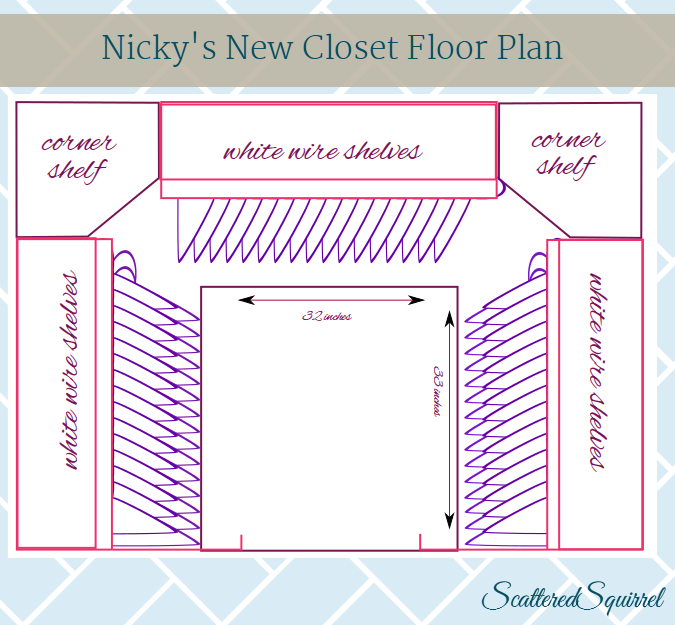 To help off set the lack of storage, Nicky’s closet has been tripling (is that even a word?) as the linen and off-season storage closet. So far she’s been trying to make do with the basic one shelf and one hanging rod per wall, that was already installed when they bought the house but no matter what she does, she can’t keep it tidy and organized. I asked if I could share a picture of it here, because she sent me one, but with no dazzling after photo to accompany it, she declined, which I totally understand! 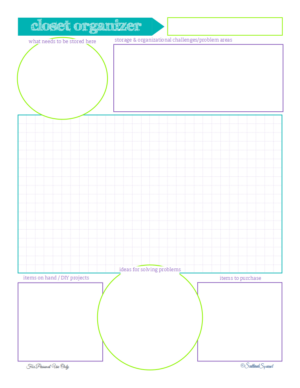 After hours of scouring the internet, neither her no I were able to come up with a photo that would make a good substitute, so here’s a bird’s-eye view I whipped up via InkScape. It’s not the greatest, but it gives you the idea anyway. The open area measures 32 by 33 inches. I used masking tape to map that out on the floor, and it’s not that big! As you can see there are lots of options, despite its small size, that could totally help her out. In the course of our chatting back and forth, Nicky asked if I could make up a closet planner printable, so that she could plan it out now, and not lose her ideas. 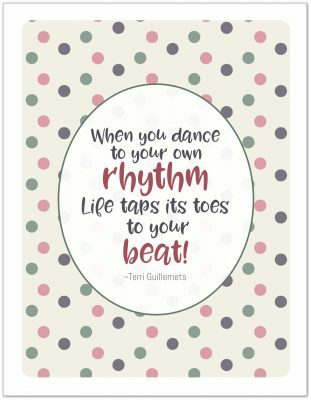 How could I say no to whipping up a printable? I made two versions of this one. One in my usual blue, green, and purple, and another one Nicky called “Summer Sunset” because she said she’d love it if I could make one with a bright pink and an orange. And here they are. Here’s what we came up with for her closet. this is where she’ll store all their off-season clothes, coats and footwear. She’s also hoping to build two corner built-ins using materials they already have. The corner shelves will become the linen closet. And lastly, she wants to add a second hanging rod to the two side walls to add some more space with the possible addition of a shoe shelf along the back wall, though she says that not crucial right now. Here’s another bird’s-eye view for you. And that’s where we left it. I have a few ideas I want to pull together for her, but she said having a starting point is just perfect for now. 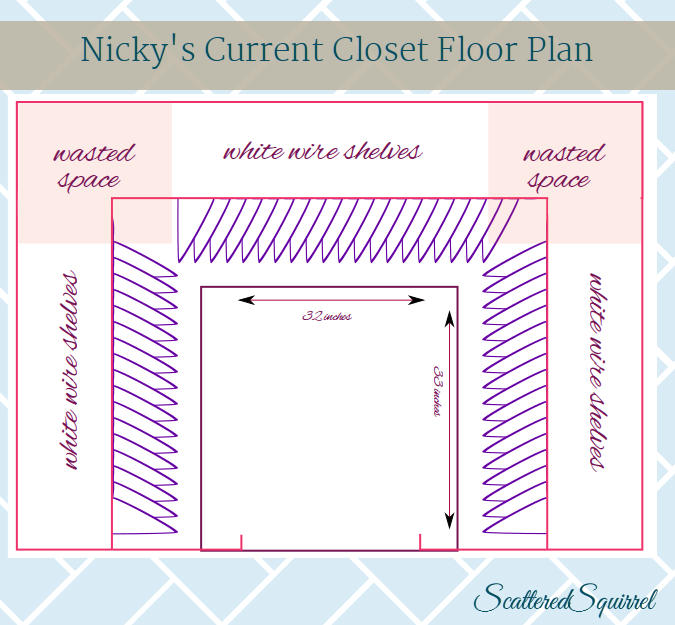 Helping Nicky with her closet woes, made me want to jump right in and work on my own. So I think I’ll print off a closet planner and get to work. 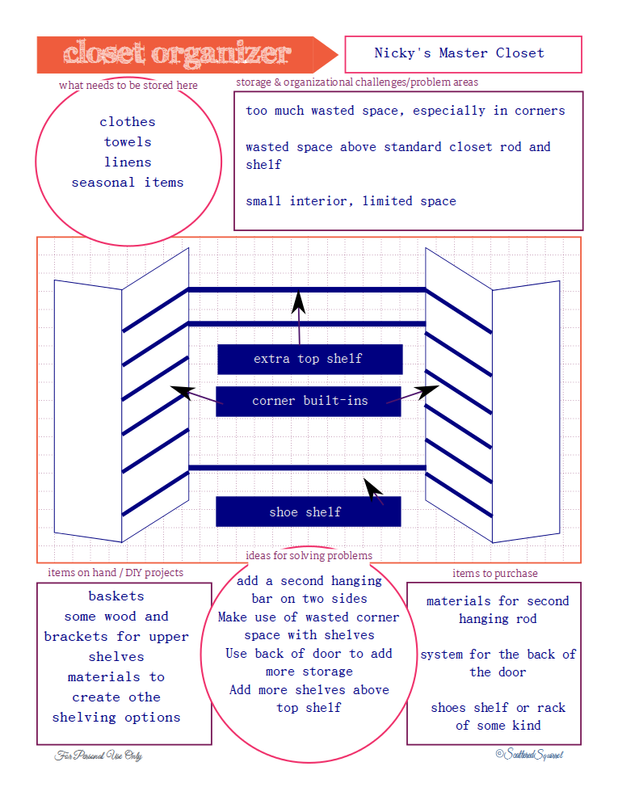 If you’re working on a closet yourself, or are wanting too, you can snag a copy of either (or both) printable for your own by clicking on their pcitures! Do you have any areas in your home that have to serve more than one function? Do have any ideas or thoughts that might help Nicky as she plans her super organized. multi-functional closet?